Sit (on an incline bench) with your arms at your sides. Grasp the weight in the desired fashion (usually with the palm facing outward - see below for clarification). Curl the weight upward (usually maintaining forearm supination, i.e. the palm is facing outward), while exhaling throughout the movement. The curling motion can be performed three ways: alternating arms, both arms at the same time, or one arm at a time. Regardless, generally incline curls are done with the forearm in a constant state of supination (i.e. the palm is facing outward). This is because when done as such incline curls uniquely target the long head (the outer/lateral head) of the biceps brachii and so are usually done with this goal in mind. This variation of curls can be extremely difficult. Be sure that the incline of the bench is set at a comfortable level; that is, one where the tendon doesn't feel overly strained. The lower the incline of the bench (closer to horizontal), the more strain the tendon will be subjected to. Incline curls allow for self-spotting, if one arm is exercised at a time. But, do note that the self-spot for incline curls is notably more cumbersome than it is for standard curls. To self-spot on curls, use your free hand to gently help (via touch spot) the working arm to raise the weight when it becomes too difficult to lift unassisted. By merely changing the way your forearm (and consequently, hand) is positioned you can adjust which/(how the) muscles will be targeted, to at least some degree; this is done through pronation and supination of the forearm. Supination is the position of your forearm when your palm is facing outward/upward, and, conversely, pronation is when your palm is facing inward. Note that for most people anatomy will inhibit the forearm from pronating as far inward as it will allow the forearm to supinate outward. Biceps Brachii - this is the muscle that most are referring to when they say "biceps". It has two heads: a short head and a long head, which are located on the front of the upper arm. The short head is located closer to the body (i.e. inner head) while the long head is located further from the body (i.e. outer head). 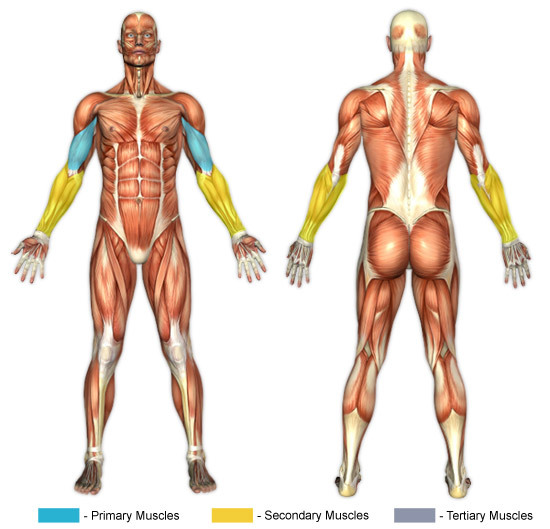 Biceps Brachialis - this muscle surrounds the main biceps muscle (biceps brachii) on both the outside and inside of it and assists the biceps brachii in flexing the elbow. Brachioradialis - this muscle is the long supinator. It helps to flex the forearm at the elbow and also allows for both supination and pronation of the forearm. Always control the weight, especially during the down movement. Letting the weight drop as the elbow reaches the bottom "locked" position causes tremendous stress on it that will likely result in injury. Keep your upper arms perpendicular to the ground throughout the movement because, as explained above, it is in this manner that this unique exercise is best utilized.